(Augusta, GA:) Reigning US Amateur and Asia Pacific Amateur champion Curtis Luck is not targeting ending his amateur career with the “Low Amateur” award at this year’s Masters. The 20-year old Perth-born Luck turned around a very disappointing opening round of 78 and fight his way back inside the top-50 with a second day level par 72 to remain at six over par in bright but continuing blustery and cold conditions. 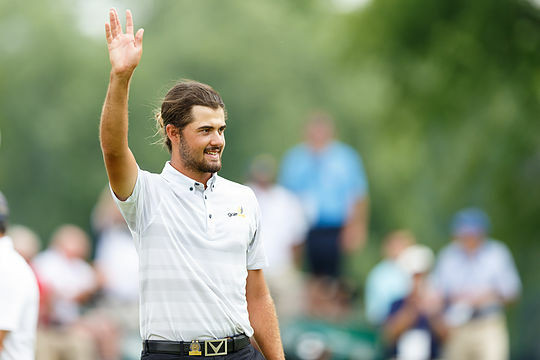 After nine straight holes, Luck finally managed a first birdie in sending a booming 331-yard down the 10th fairway and landing his second shot to 22-feet and sinking the putt – the same hole fellow Aussie Adam Scot captured the 2013 Masters in a play-off. Luck then collected a second birdie of his round, and for a second day running, at the par five 13th hole where he laid-up in two some 38 yards short of the flag, and just in front of Rae’s Creek, before chipping to four feet and a third birdie of his round. However a bogey at 14, where he took three shots to get up-and-down from the back of the green, started a roller-coaster few holes for the Cottesloe golfer as he bounced back with a birdie at 15 but dropped a shot for a second day in succession at the par three, 16th and this time leaving himself a 50-footer from where he would three-putt. And also the 18th jumped-up to bite Luck again in ending his round with a second bogey. But there was no hiding Luck’s delight knowing he’s now playing all four rounds ahead of turning pro straight after the Masters. “I’m really happy with the way I played,” he said. “And then 18 I thought I hit it in ‑ I actually hit two quite good shots in, misjudged the wind a little, but thought I missed it in the correct spot in that front trap with the front flag, and got up there and it was plugged. So, I couldn’t really do much, unfortunately. Five amateurs teed-up on Thursday in the Masters but with only two making the cut – Luck and American Stewart Hagestad, the 25-year old Californian who captured last year’s US Mid-Amateur Championship. Hagestad posted scores of 74 and 73 to be lying at three over par. And England’s and reigning British Amateur champion, Scott Gregory who defeated Luck late last week in the Georgia Cup in Atlanta, found himself packing in crashing to 88th place in the 93-player field with scores of 82 and 75 for a 13-over par tally.